Ten yoga poses for the lymphatic system and immunity improvement are discussed. These yoga poses improves the immune system through lymph drainage. The lymphatic system plays a vital role by removing wastes and toxins from the body and in maintaining its immunity against pathogens. It does this by moving the lymph fluid towards the neck. Lymph is a water like fluid containing water, proteins and other substances. It drains the excess interstitial fluid, excess proteins and toxic substances from between the cells. Yoga poses help to move and drain out the excess lymph. The healthy functioning of the lymphatic system can be hindered or stopped due to factors such as venous insufficiency, stress, chemical overload, injuries, age, lack of activity and increased consumption of food additives. These ten yoga exercises with healthy lifestyle improve the flow of lymph and enhances the immune system. 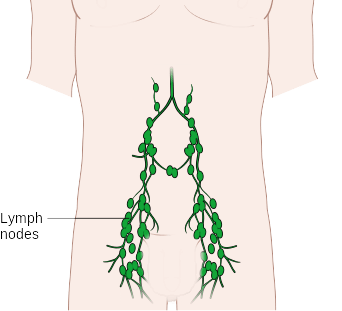 The lymphatic system is a network of tubes (capillaries and vessels) that drain excess fluids from the body’s cells and return them to the bloodstream for eventual filtering and excretion. 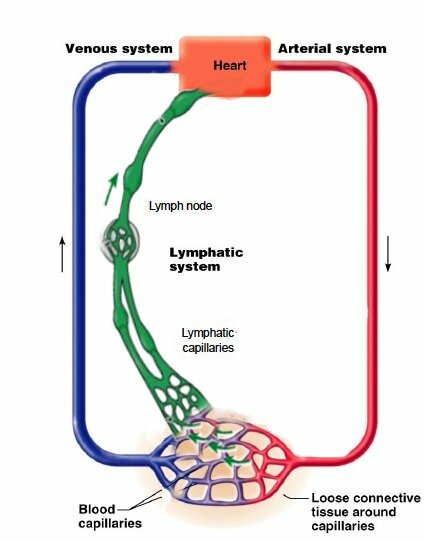 The lymphatic system contains three parts, a network of lymphatic vessels and capillaries, a fluid inside of the vessels called lymph, and lymph nodes that filters the lymph while it passes through. 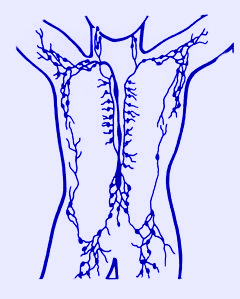 The lymphatic system is part of the immune system and plays a major role in protecting the body against infections. The lymphatic system returns fluids that have leaked from the blood inside the cells, back to the blood. Without it, our cardiovascular and immune systems would begin to shut down. Lymph is slightly yellow colored water like fluid. It is a mixture of about 90% water and 10% solutes such as proteins, cellular waste products, dissolved gases, and hormones. The body is composed of about 60% water and the blood is only about 20% of this water. Most of our body’s water is the lymph fluid! Lymph may also contain bacterial cells that are picked up from diseased tissues and the white blood cells that fight these pathogens. Lymph may pick up bacteria and bring them to lymph nodes where they are destroyed. Lymph also transports fats from the digestive system. The Lymph is slow to move and it moves because of muscle activity and deep breathing. Lymph flows in only one direction within its own system. This flow is only toward the neck. Here, it flows into the venous blood stream through the subclavien veins which are located on either sides of the neck near the collarbones. Lymph nodes are like holding stations that filter the lymph fluid and capture microbes for B and T cells to deal with. They are located in your armpits, groin, neck and around the blood vessels of your chest and abdomen. The main functions of the lymph nodes are to filter the lymph and to remove harmful micro-organisms, damaged or dead tissue cells, large protein molecules and toxic substances. This filtering system prevents dead cells from reaching the bloodstream. Lymph nodes do not deal with major toxicity, which is primarily dealt with by the liver and kidneys. The lymph fluid inside the lymph nodes contains lymphocytes, a type of white blood cell, which continuously recirculates through the lymph nodes and the bloodstream. There are 200 to 700 lymph nodes in the body, half of which are located in the abdomen. There is also a high concentration of lymph nodes (150 to 200) in the neck. Because the neck area is so rich in lymph nodes, the lymph flow in the neck determines the condition of the lymphatic flow throughout the entire body. The lymphatic system has no pump, its nourishing, water balancing and eliminative functions are dependent upon muscle contractions, diaphragmatic breathing and body movements. Yoga for immune system includes stretching, twisting and bending stimulate the flow of lymph. Here are ten yoga poses that can improve your immunity. Use a long pillow on the floor as support. Lie down on the floor near the wall and slowly put your legs up the wall. Sit with your hips against the wall and roll onto your back, taking your legs up the wall. Your position should be pressing as close to the wall as you can. Spend 5 to 10 minutes there. Encourages full-body blood circulation. This asana stretches the shoulders, legs, spine and whole body; builds strength throughout the body, particularly the arms, legs, and feet; relieves fatigue and rejuvenates the body; improves the immune system. The body forming an inverted V-shape. This pose stimulates the thymus gland. Cobra pose strengthen the spine, stretch the chest, shoulders, and abdomen, firm the buttocks, and relieve stress and fatigue. This pose strengthen your abdominal organs. This pose stimulates the thymus gland by opening up the chest. Tis pose adds greater flexibility to the back and a good stress and fatigue buster. This pose stimulates the thymus gland and improves blood circulation. The bridge pose curl up your body and feel your tired back relax instantly. It stimulates the endocrine and nervous systems. Stand up straight, and place your feet slightly more than shoulder width apart. Turn right toes out and left toes inward at a 45-degree angle. Keep both legs straight as your hinge at your hips toward the right leg. Stretch your right arm up, then bend to your left, sliding your left hand down your thigh. Do not twist your body. Hold for 30 seconds, working up to 2 minutes with practice. Inhale as you straighten up again. Repeat the pose on the other side. Cat-Cow is a gentle sequence of two poses that stretches the spine and prepares the body for activity. Start on your hands and knees in a “tabletop” position. Make sure your knees are set directly below your hips and your wrists, elbows and shoulders are in line and perpendicular to the floor. It is performed on the knees and is often used as preparation for deeper back-bends. Camel pose helps to stretch abdominal organs, the throat and thyroid and parathyroid glands. This pose rejuvenates the thyroid and parathyroid glands through compression. It stretches the spine as you bend forward and bring all the weight to the crown of the head. It improves thyroid function. Dynamic yoga poses, such as the Suryanamaskar, or “Sun Salutation,” keep the body moving. This is vital to improve the lymphatic fluid flow throughout the body. The sun salutation is actually a series of 12 postures, one flowing into the next, while moving with the breath. It begins with mountain pose and prayer position, then inhaling and reaching up overhead with the palms together, and exhaling into a standing forward bend. Here are few more tips to improve immune system through lymph drainage. Mustard oil body massage before bath is a common practice in India. You can do this by yourself. This massage promotes lymph flow by gently pressing the skin in the same direction as the lymph is traveling—from the feet and hands up toward the neck. Spend more time in the axilla (armpit), and circle around each breast because a lot of lymphatics are here. Manual lymph drainage massage uses a specific amount of pressure (less than 9 ounces per square inch or about 4 kPa) and rhythmic circular movements to stimulate lymph flow. 70% of the lymphatic vessels are located just underneath the skin. If you use too much pressure, you bypass these vessels. The lighter the touch, the more powerful the effect on the lymphatic system. Do not mix mustard oil with any other ingredient. You can use warm mustard oil if you are suffering from body pain or cold. Mustard oil massage benefits the body deeply as it relieves pain and makes you relax. As neck area is rich in lymph nodes, you can gently massage the neck area with mustard oil. Water is simply crucial for proper functioning of the lymphatic system. Because the Lymphatic System is about 96% water. Roughly 60 percent of our body weight is water. Lack of water can lead to dehydration. Dehydration can drain your energy and make you tired. To stay well hydrated, you should drink 2.2 to 3 liters of fluid per day. Most of your body’s water is the lymphatic fluid! Walking meditation is good way for lymph drainage and immunity improvement. When you walk at a brisk pace your legs provide a natural pumping action which serves to move the lymph fluid through the lymphatic system. . Since there are so many lymph nodes in the upper body, armpits, neck and shoulders, arm movement is important during walking. Rebounding creates an increased gravitational load and positively stresses in every cell in your body. A rebounder can be purchased for as little as $25 US dollars. A rebounder is like a mini-trampoline, around four feet in diameter. It’s close to the ground, so all you do is step up and bounce up and down for 5 to 10 minutes, indoors or outdoors. Rebounding are series of small, controlled movements. Rebounding reduces your body fat; firms your legs, thighs, abdomen, arms, and hips; increases your agility; and improves your sense of balance. This entry was posted in Articles, Health, Immunity Research, Longevity Research, Yoga, Yoga for Stress Relief, Yoga Postures, Yoga Research and tagged Bow pose, Bridge pose, Camel Pose, Cat-Cow Pose, Cobra pose, Downward Facing Dog, Drink Plenty of Water, healthy lifestyle, Legs up the wall, Lymph, Lymph Movement, Lymph nodes, Lymphatic System, Mustard oil Body Massage, Rebounding, Sun Salutation, Triangle Pose, Walking lymph drainage, yoga for immune system. Bookmark the permalink.